Colleen is currently a candidate at Johns Hopkins University School of Advanced International Studies (SAIS) in the Master of International Public Policy program with an affiliation in Conflict Management and will graduate in December 2018. Colleen is a native of Buffalo, NY and graduated from the United States Coast Guard Academy in 2009 with a Bachelor of Science and a commissioning as an Ensign in the U.S. Coast Guard. Immediately following graduation, she served on the Coast Guard Cutter FORWARD. In January 2010, the FORWARD responded to an earthquake that struck Port Au Prince, Haiti. As a responder, she led the first shore excursions into Port Au Prince to provide medical care and deliver humanitarian supplies. She was also responsible for coordinating helicopter medical evacuations in and out of the harbor. In 2011, she sailed with the FORWARD to Western Africa where she trained the newly created Liberian Coast Guard, Senegalese Navy, and Sierra Leone Navy. After completing another at-sea assignment and then a shore-side special staff assignment, in 2015, she transferred to serve as the Commanding Officer of Coast Guard Cutter DONALD HORSLEY, in San Juan, Puerto Rico. While captain of the ship, the crew netted over $7 million in illicit narcotics, successfully interdicted multiple human smugglers, and conducted Search and Rescue operations in the Caribbean which resulted in seven lives saved. After returning from his fellowship over the summer, Colleen discussed with AP the impacts the fellowship had on him. 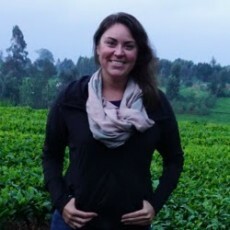 "Working with CPI Kenya and doing actual peacebuilding work in the field was an invaluable experience. My 10 weeks taught me so much and exposed me to how the dedicated work of just a few individuals at CPI Kenya has completely transformed the communities of thousands of pastoralist families. It also showed me how resilient the human spirit is; the families and children we worked with have struggled through so much, yet are still kind, generous and optimistic. It was truly an incredible and humbling experience." There is an old African story about a hummingbird and a jungle fire.